One who passes the urine which is astringent by nature , sweet, pale and rough should be diagnosed as a case of madhumeh which because of the vitiation of vata dosha. Diabetes is correlated with madhumeh or prameh. It is described by Acharya charak in charak Samhita Nidan sthan. Prameh is a tridoshaj disease but initially, it starts with the derangement of Kapha Dosha. Excessive intake of kapha prakopak ahara vihara can lead to the vitiation of Kapha Dosha. Symptoms related to prameha are krisha (asthenic), Rauksha (dryness in the skin), Bahu pipasa (Excessive thirst), sthula (obese) and bahuasi (Excessive hunger). One type is Sahaja meha which is hereditary and another one is apathyanimitajja which is acquired. Udakameha, ikshubalika, sandrameha, Sandera prasadameha, shuklameha, shukrameha, siktameha, sitameha, shanairmeha and alalameha. Kshurdrameha, kalameha, nilameha, lohitameha, manjishthameha and haridrameha. Vasameha, majjameha, hastimeha and madhumeha. Diabetes is a condition which impairs the ability of the body to process blood glucose and is a group of metabolic diseases marked by the high blood glucose level resulting from defects in insulin production. Lack of insulin production affects the metabolism of fats, carbohydrates, and proteins which in turn causes disturbance of water and electrolyte homeostasis. Having pre-diabetes can put you at a higher risk of getting type2 diabetes. Diabetes can damage your nerves, eyes, and kidneys and may also cause heart disease. What Are the types and Symptoms of diabetes? This condition is also known as juvenile diabetes and can occur when the pancreas fails to produce insulin due to loss of beta cells. An individual with type 1 diabetes is mostly insulin dependent, which means the individual must take artificial insulin to stay alive. So, it is also known as insulin-dependent diabetes mellitus (IDDM). In this condition, the pancreas still produces insulin but fails to resists the insulin properly, unlike in type 1 and it affects the way the body uses insulin. It has strong links with obesity and lack of exercise. This condition is also referred to as non-insulin dependent diabetes mellitus or adult-onset diabetes. This occurs in pregnant women during pregnancy when the body becomes less sensitive to insulin. It does not occur in all pregnant women but when occurs, then it usually resolves after giving birth. In Hindi language, gurmaar is known as “The sugar killer” and it has been used in Ayurveda since ages for controlling the blood sugar level Extract of this herb plays an important role in reducing the craving for sugar. Some researchers have shown that it contains molecules of gymnemic acid in the intestines and also inhibits its entry into the bloodstream. It is the best and effective herb for the controlling of blood sugar levels that may contribute to insulin secretion and also cell regeneration that may contribute to blood sugar lowering capabilities. Karela is also known as a bitter guard or bitter melon and is a unique vegetable-fruit that can be used as a medicine or food. This fruit has long been used as herbal remedy for a range of ailments, including type2 diabetes. It contains an active substance called charantin which has anti-diabetic properties which can reduce the blood sugar levels. It also contains vicine and an insulin-like compound known as polypeptide and these substances work either individually or together that can help to reduce the blood sugar levels. The bark of vizaysaar is useful for diabetes. The bark of the tree is used to make a wooden glass and this glass is termed as “The miracle care for diabetes”. It increases the digestive fire and also increases the insulin production in the body. Pour some water in the wooden glass and keep it for overnight and the water is consumed by the diabetic patients early in the morning on an empty stomach. The color of the water changes to brown and change this wooden glass after one month until the watercolor does not change. Saptrangi is a wonderful Ayurvedic herb used for diabetes. Its bark is very effective in controlling the diabetes. The main constituents of this herb are kotalanol and salicin which acts as glucose inhibitors. These inhibitors lower the risk of complications caused by diabetes mellitus. Ashwagandha is an effective herb which is especially used for diabetic neuropathy, fatigue, weakness and weight loss due to diabetes. This herb is adaptogenic which relieves stress and anxiety. Some researchers said that this herb is used to lower the blood sugar levels in the body by increasing the insulin secretion and improves the sensitivity of insulin in the muscle cells. It can also reduce the cortisol levels because increased cortisol level may lead to high blood sugar levels in the body. Reduced cortisol levels help the body to deal with stressful situations and keep the sugar level under control. Tulsi is popularly known as the holy basil and is known to be a significant part of ayurvedic medicines. Its leaves, seeds, and stems are edible and are used in various Indian delicacies. Being an anti-inflammatory, it can prove to be a cure to several diseases. Tulsi is said to improve the pancreatic beta cell function and insulin secretion that further increases the uptake of glucose by muscles. Leaves of Tulsi has hypoglycemic properties which lower the blood sugar level and prevents further complications related to diabetes. Fenugreek can improve the metabolic symptoms associated with type 1 and type2 diabetes. It contains high soluble fibers which are helpful in lowering the blood sugar levels by slowing down the digestion and absorption of carbohydrates. Its seeds are the richest source of minerals, vitamins and antioxidants, which help to protect the cells of the body from damage caused by unstable molecules known as free radicals. Diabetes is one of the most common health conditions faced by millions of people across the world. Managing diabetes is tough but it is not impossible. Diabetes is a condition that hinders the body’s ability to respond to insulin which leads to the abnormal metabolism of carbohydrates leading to spiked blood sugar level. There is abnormally high levels of blood sugar level in diabetes. What are the causes of Diabetes Mellitus? Diabetes is known as “Madhumeha” in Ayurveda. It arises due to aggravation of obstruction of channels through blockage by Kapha dosha and fatty tissue and aggravation of Vata dosha which causes tissue depletion. 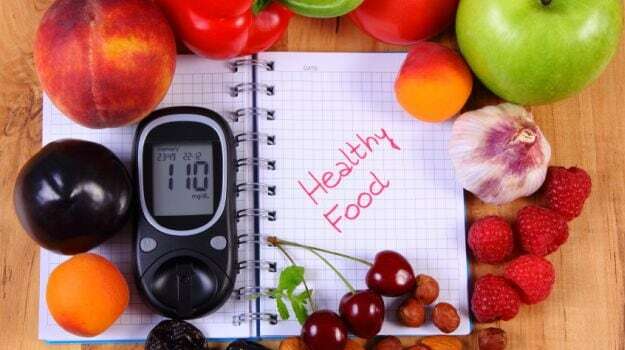 Diabetes is considered as a lifestyle disease. Since a long time, Ayurveda has been emphasizing on the importance of diet and lifestyle in the maintenance of health, according to which a healthy man is referred as: “one who indulges daily in healthy diet and lifestyle activities, who discriminates between wholesome and unwholesome and acts accordingly. It is also said in Ayurveda that in both health and disease, the wholesomeness and the unwholesomeness is a prime factor to be thought about, as without proper diet, the use of any drug is futile. There are some specific fruits that have been shown to produce effects on blood glucose level as these fruits have low glycemic index and high amount of fiber. There is a lot of confusion while selecting fruits for a diabetic patient but moderation is the key here. Fruits which are seasonal, fresh and low in glycemic index should be consumed by a diabetic patient. Fruits should be enjoyed as a snack and not be eaten with main meals. Sprinkle cinnamon on fruits which is very useful in balancing blood sugar levels. There is a false assumption that people suffering from diabetes should avoid fruits because there sugar present in fruits could push up their blood sugar level. But this is a false conception because sugar present in fruits is usually in the form of fructose and unlike other sugars such as sucrose, fructose has low glycemic index. Less insulin is needed for the metabolism of fructose. Therefore, intake of fruits is not associated with sudden rise of the blood sugar level. Apples can be eaten by diabetic patients because apples are a rich source of Vitamin C, fiber and several anti-oxidants. The fiber present in apples helps in stabilizing blood sugar levels. They are the rich source of polyphenols as well. The polyphenols present in apples slow down the digestion of carbohydrates and thus lower the blood sugar levels. Apples also contain pectin which is a form of carbohydrate which helps in controlling blood sugar level by releasing it slowly into the bloodstream. Pomegranates contain the richest combinations of anti-oxidants. Therefore, they can protect the body from free radicals. They are a rich source of phytochemical compounds as well. Guava is very rich in dietary fiber and it has low glycemic index as well. Therefore, eating guava reduces the sugar absorption in the blood. It is also rich in dietary fiber which helps to ease constipation as well. Eating guava lowers the chances of developing Type 2 diabetes. It also contains potassium which helps in regulating blood pressure. Watermelon is rich in potassium. The high potassium content in watermelon makes it one of the best fruits for proper kidney functioning which helps in lowering the blood uric acid levels. Therefore, it helps in preventing kidney damage in diabetic patients. Moreover, lycopene present in watermelon helps in reducing the nerve damage in diabetic patients. Papaya is a rich source of natural anti-oxidants so this fruit should be consumed by diabetic patients. The anti-oxidants present in Papaya prevent the cell damage because it contains essential minerals and nutrients. Diabetic patients are prone to many ailments including nerve damage caused due to irregular blood sugar levels. Papaya is useful in obstructing future cell damage and a longer life span. Oranges are a rich source of flavonones, flavonols and phenolic acid. It has tremendous protective potential especially for the patients suffering with diabetes. This fruit is regarded as a specific ayurvedic medicine because of its specific action on the pancreas. The fruits, seeds and the whole fruit are useful in the treatment of diabetes. Due to the presence of compound known as jamboline in the seeds, it is used as a medicine in the treatment of diabetes. This fruit has the ability to convert starch into sugar and has hypoglycemic effect that helps to reduce blood sugar levels. Bael fruit is very famous due to its various medicinal properties but the leaves of this tree are scientifically proven to anti-diabetic. Drink freshly prepared juice of its leaves along with the pinch of black pepper. This juice is very effective in controlling blood sugar. Strawberries have low glycemic index so they are very beneficial for patients suffering with diabetes. The sugar present in strawberries is slowly released in the blood stream as glucose. Intake of strawberries also increase metabolism which helps in weight loss also. Cherries are considered as the rich source of anthocyanins which is responsible for its bright red colour and cherries are the rich sources of enzymes as well. This red colour helps to protect the heart. The enzymes present in cherries are known to boost insulin levels that helps to control blood sugar levels. What is the role of diet and lifestyle change in diabetic patients? Can diabetic patient take fruits? What type of sugar is found in fruits? Why apples are considered good for diabetic patients?